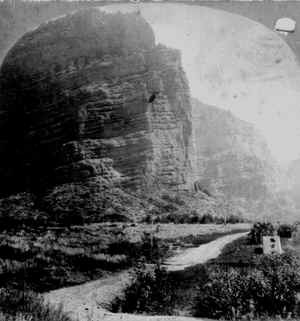 The formation in the foreground was called the Great Eastern or Steam Boat Rock. The decks can be seen with the people looking out. On the stern can be seen the flag flying. At the base of the Great Eastern are many bill boards. "Thomen supposed Father Noah must have come this way with his Ark, and abandoned part of the same"